In the summer semester of 1897 David Hilbert (1862-1943) gave an introductory course in Invariant Theory at the University of Gottingen. This book is an English translation of the handwritten notes taken from this course by Hilbert's student Sophus Marxen. 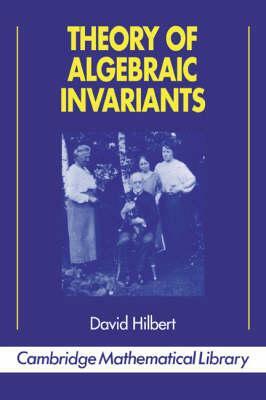 The year 1897 was the perfect time for Hilbert to present an introduction to invariant theory as his research in the subject had been completed. His famous finiteness theorem had been proved and published in two papers that changed the course of invariant theory dramatically and that laid the foundation for modern commutative algebra. Thus these lectures take into account both the old approach of his predecessors and his newer ideas. This bridge from nineteenth- to twentieth-century mathematics makes these lecture notes a special and fascinating account of invariant theory. Hilbert's course was given at a level accessible to graduate students in mathematics, requiring only a familiarity with linear algebra and the basics of ring and group theory. Preface; Introduction; Part I. The Elements of Invariant Theory: 1. The forms; 2. The linear transformation; 3. The concept of an invariant; 4. Properties of invariants and covariants; 5. The operation symbols D and D; 6. The smallest system of conditions for the determination of the invariants and covariants; 7. The number of invariants of degree g; 8. The invariants and covariants of degree two and three; 9. Simultaneous invariants and covariants; 10. Covariants of covariants; 11. The invariants and covariants as functions of the roots; 12. The invariants and covariants as functions of the one-sided derivatives; 13. The symbolic representation of invariants and covariants; Part II. The Theory of Invariant Fields: 14. Proof of the finitenesss of the full invariant system via representation by root differences; 15. A generalizable proof for the finiteness of the full invariant system; 16. The system of invariants I; I1, I2, ..., Ik; 17. The vanishing of the invariants; 18. The ternary nullform; 19. The finiteness of the number of irreducible syzygies and of the syzygy chain; 20. The inflection point problem for plane curves of order three; 21. The generalization of invariant theory; 22. Observations about new types of coordinates.